If you're a cute kid, then you can get away with a heck of a lot more than an adult can. For example, if you're a kid on an airplane, flailing in your seat and crying is pretty much expected. If you're an adult? Well, let's just say it's not going to end well for you. The same goes for sharing food. Like how weird would it be if me, a 215-lb hairy man was sitting next to Prince Harry, and I just reached into his popcorn box and helped myself? Pretty weird. But if I was this adorable little girl who helped herself to some of his snackage, no one bats an eye. 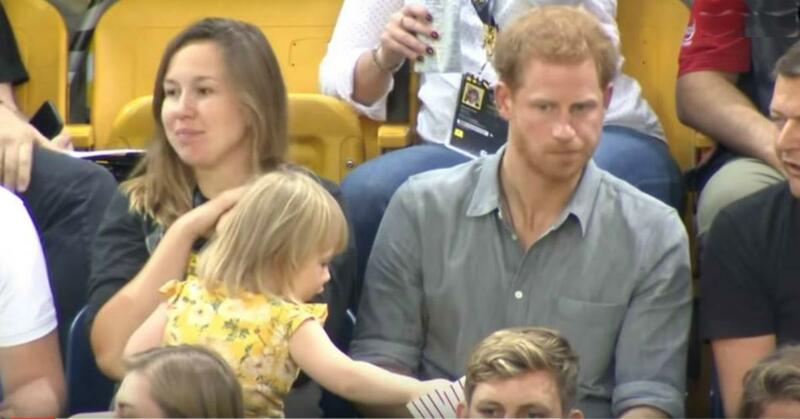 Harry was in attendance at the Invictus Games in Toronto to watch the semi-finals volleyball game between the UK and Denmark and was seated next to the wife and daughter of his friend, British Paralympian David Henson. It took him a while before he realized that the little girl was enjoying his grub, before he started to tease her and joke around with the kid. Twitter was in love with the cute interaction that was caught on camera. If we learned anything from this great moment, it's that snacks are never safe around toddlers.